We’d love your help. Let us know what’s wrong with this preview of A Palestinian Christian Cry for Reconciliation by Naim Stifan Ateek. To ask other readers questions about A Palestinian Christian Cry for Reconciliation, please sign up. 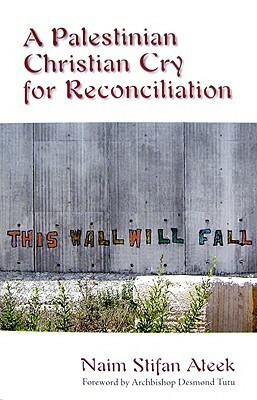 Naim Stifan Ateek, A Palestinian Christian Cry for Reconciliation (Maryknoll, NY: Orbis, 2008). Arab Christian families' lives were irreversibly changed by Al Nakba, (The 1948 Pal Naim Stifan Ateek, A Palestinian Christian Cry for Reconciliation (Maryknoll, NY: Orbis, 2008). Arab Christian families' lives were irreversibly changed by Al Nakba, (The 1948 Palestinian exodus, Arabic for "disaster", "catastrophe"). Palestinian Christians are marginalised by Muslims, Jews and Western-Christians. Naim S. Ateek “The Emergence of a Palestinian Christian Theology.” - Palestinian theology of liberation was influenced by: Pastoral aspect, Indigenous factor, Biblical question, Theological factor. Pastoral aspect = Clergy working amongst the grassroots, hearing their cries and physical sufferings aggravated by the religious argument in the political conflict. Where is God in all of this? Why does God allow the confiscation of our land? Why does God allow the occupation and oppression of our people? Indigenous factor = Foreign expatriate clergy have for a long time controlled Palestinian churches. An indigenous response needed. These 4 factors, in interaction with the political reality, made a Palestinian theology of liberation necessary. At the heart of this theology of liberation is the question of God. The Bible and the Land: Ateek insists that the OT must be read through the lens of Christ; a Christological hermeneutic is essential for resolving this complex issue of the land. Ateek, insists that Palestinian Christians must have a Christo-centric (therefore NT-centric) hermeneutic which emphasizes an inclusive view of 'land' as opposed to a ethnic-oriented exclusivity to the occupation of 'land', specifically the land of Canaan/Palestine/Israel. Ateek suggests that from a NT perspective nobody (including Jews) have an exclusive claim to the land. Ateek refers to five key NT texts - Matt 5:8; John 1:43-51; Rom 4:13; Eph 2:19-20; Acts 7:48; (plus Gal 3:15-18, 26, 28). The main result of Ateek's study of those 6 NT verses is to conclude that whereas the main OT focus of blessing is the land of Israel, in the NT it hugely broadens in scope to the whole world--or better,cosmos--in Christ. This book sets important context for the news about the conflicts in the Middle East, but from a perspective not usually presented in the media. Naim Ateek presents a Christian perspective on the Occupation, presents Biblical and theological support for justice, and argues against both Christian and Jewish Zionism. This is an excellent resource for understanding the Kairos Palestine Document, of which Ateek is one of the authors. Firmly rejecting violence by all sides and actors, he asks for justi This book sets important context for the news about the conflicts in the Middle East, but from a perspective not usually presented in the media. Naim Ateek presents a Christian perspective on the Occupation, presents Biblical and theological support for justice, and argues against both Christian and Jewish Zionism. Another important book from a key figure in the Israeli-Palestinian debate that truly highlights the Christian perspective. Excellent, rooted in the author's personal experience. I wish every Christian would read this book.